Not sure whether to use a colon or a semi-colon? Not sure where the apostrophe should go? Not sure whether ‘a lot’ should be two words or one? Just checking? 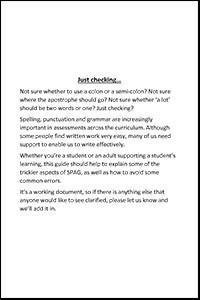 Spelling, punctuation and grammar are increasingly important in assessments across the curriculum. Although some people find written work very easy, many of us need support to enable us to write effectively. Whether you’re a student or an adult supporting a student’s learning, this guide should help to explain some of the trickier aspects of SPAG, as well as how to avoid some common errors.